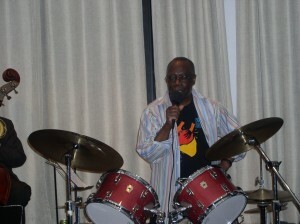 Diaspora (Dispersions of the Spirit of Ra) experienced an amazing reunion on Saturday, April 10, 2010 at Sistas’ Place. The group featuring Alex Harding on baritone sax, D.D. Jackson, pianist with bassist Radu, drummer Reggie Nicholson, poet Louis Reyes Rivera and poet/vocalist Monique Ngozi Nri, is a phenomenal band that last performed together as a unit in Washington D.C. at Freedom Plaza on a hot early evening July 4, 1999. The only musician that was different from then to now was D.D. Jackson, who replaced guitarist Masujaa in the Ensemble in recent years. The 1999 concert was memorable for several reasons. It was a double bill with Craig Harris’ Tailgator Tails and that group featured Carla Cook, who was not a known entity, at least to us, at that time. The outdoor temperature was a very humid 104 degrees, in the shade. Another important detail of that concert was the fact that the wonderful Katea Stitt (daughter of the great Sonny Stitt, who is a producer and supporter of many musicians including the late great Sekou Sundiata ) brought these two groups together. Yet another important fact was that Paxton K. Baker, Senior Vice President of BET, was in the audience and that was a very significant reunion. 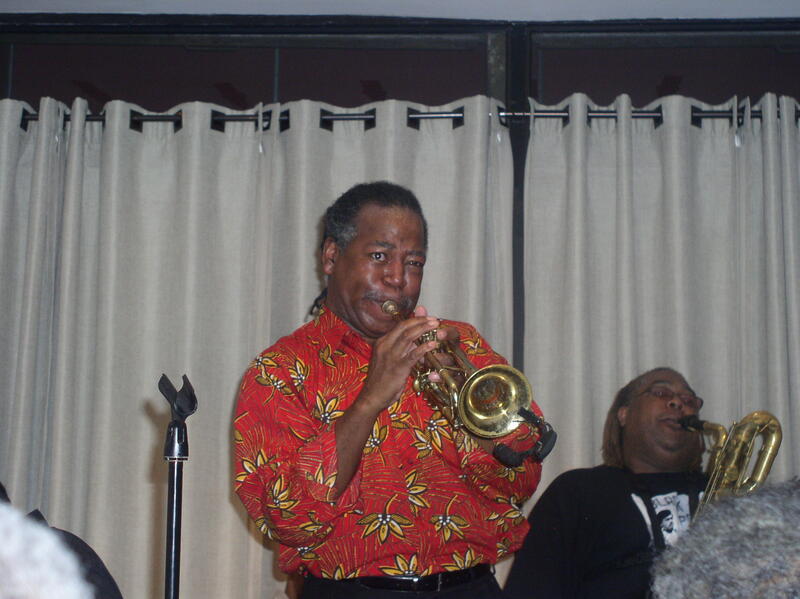 Mr. Baker (who I had known through my work with Sun Ra), before he was head of a student committee at Temple University, when he brought the band called the Group (Marion Brown, Billy Bang, Sirone, Andrew Cyrille and Ahmed Abdullah) there in 1986, was now in a very powerful position. As Senior Vice President of BET on Jazz (it’s name at the time) he was able to help the Jazz cafe that Viola Plummer had just asked Abdullah (circa;1998) to be the Music Director of. Mr. Baker offered Sistas’ Place a very generous stipend that unknown to us at the time would last for at least seven years and would help the venue grow into a world class cultural institution. Another attendee was Deborah Ifeoma Nri, who traveled from London to NY and DC to hear the gig. Abdullah believes it is important that his own compositions be played, at least by his groups, even if no one else plays them. Hence, the beginning of the show. The next composition was one by another progenitor of the Music of the Spirit, Sun Ra. His composition, We Hereby Declare… served up enough funk to get the audience ready to dance and the capacity crowd seemed like they were ready. The group then moved into another original called Allah’s Blues. Both of the last mentioned songs featured the poetry of Louis Reyes Rivera. He was able to get to the essence of the music with his words. The set ended with Canto II, an African-Brazilian piece originally heard on one of Clemetina De Jesus’ recordings. Unfortunately Ms. De Jesus was stumbled upon by Ahmed Abdullah in the same year she left the planet, 1987. 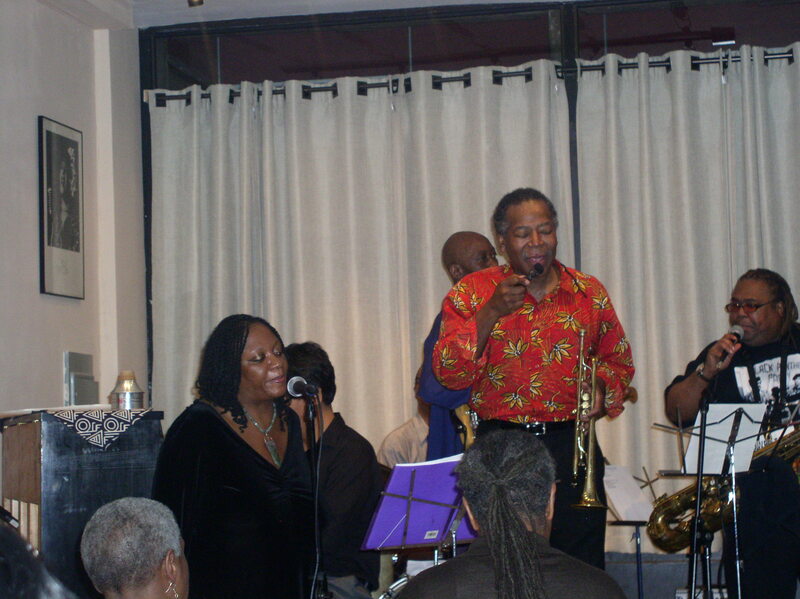 However, on another Silkheart recording done in that same year, Canton II with the Solomonic Quintet featuring Charles Moffett, was recorded and in the year 2001,the song was recorded again with NAM (Alex Harding, Masa Kamaguchi and Jimmy Weinstein) on a recording called Live At The Vision Festival. Even the intermission was full of the energy that only Sistas’ Place and the music can create. Viola Plummer, acting as MC, introduced the house to a lady named Laura who was celebrating her birthday (and who is related to Oliver Bish of Sistas’ Place). After a vigorous happy birthday sung by everyone, Laura introduced her family (which included her daughter who is expecting a baby). Louis was moved to recite a poem for the child to be which began, ” I would have liked to have met you…” By the end of the poem there were barely any dry eyes in the house. The second set began with one of Sun Ra’s one hundred compositions that go by the name of Discipline. This one called Discipline 27. As explained to the audience, Sun Ra was big on discipline because he believed in Freedom and knew that one does not exist without the other. Throughout the night a woodwind player from Chicago, Ernest Dawkins, was in the house. As the Ensemble moved to African soil with the Miriam Makeba composition Magwalandini, Mr Dawkins was asked to sit in on alto saxophone. The group and house that was already in high gear went into orbit. 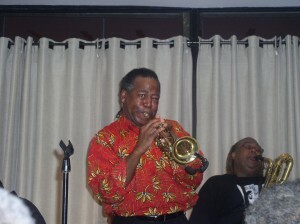 Mr. Dawkins is a mean alto sax player who truly plays music from his soul and of the spirit. Everybody stretched out on this number and much room was given to Reggie Nicholson who did some magnificent mallet work before the song was brought to a close. Magwalandini is a South African song and gives reason why Diaspora is both about the Dispersions of the Spirit of Ra and the African Diaspora. Next, the band did a sing-a-long with What Do You Do…The lyrics of which say “What do you do when you know that you know that you know that you’re wrong?” Well, according to Sun Ra, the only thing you can do is “face the music and listen to the cosmos song”. The next piece, Tapestry From an Asteroid is a very interesting Sun Ra composition in that for all the years we’ve heard it, we never heard both lyrics and music played together. Back in the days of touring with the Sun Ra Arkestra, the Maestro would have June Tyson sing this beautiful melody, acapella. The band would only come in at the end of the song with a space chord and that would be that. Both lyrics and melody are beautiful and puts one in mind of something beyond the ordinary. 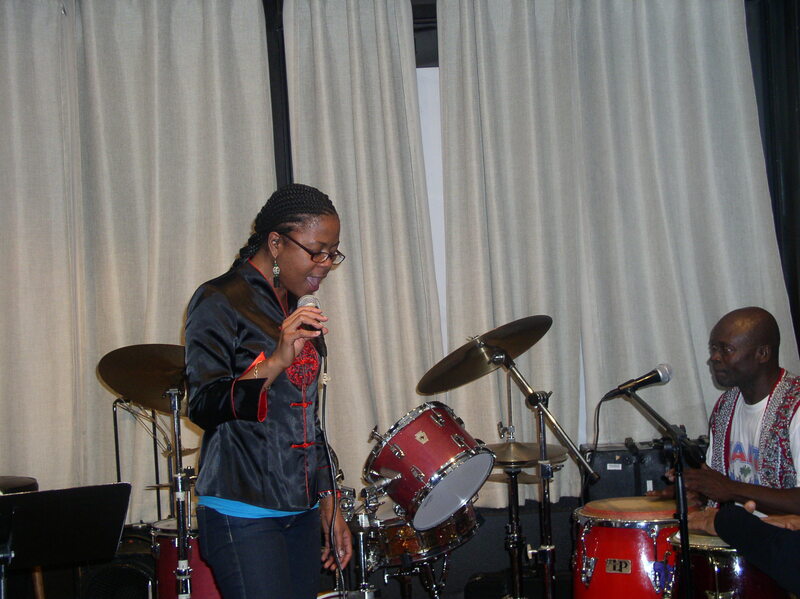 Monique Ngozi Nri did a splendid job of singing the melody with Alex Harding adding some fantastic obbligato work. D.D. Jackson played 16 superb measures and the song was taken out again. Traveling the Spaceways was the appropriate last song of the evening. It began as duet with Alex Harding and Radu doing a gutsy exchange that brought everyone into their world. After the song built to a crescendo with Louis Reyes Rivera’s poetry expressing the spirit of the song, the audience was invited to do the “space hop,” which once again got house with the audience on their feet. It was a wonderful night, a Sistas’ Place night where we combine the cultural with the political and the social. After Viola Plummer’s brilliant closing remarks in which she complimented all the members of the D12 Movement for their dedication to the cause, donations were raised towards the ongoing rescue effort in Haiti. Welcome to our first blog about the Music of the Spirit that is performed at Sistas’ Place on Saturdays from September to June. 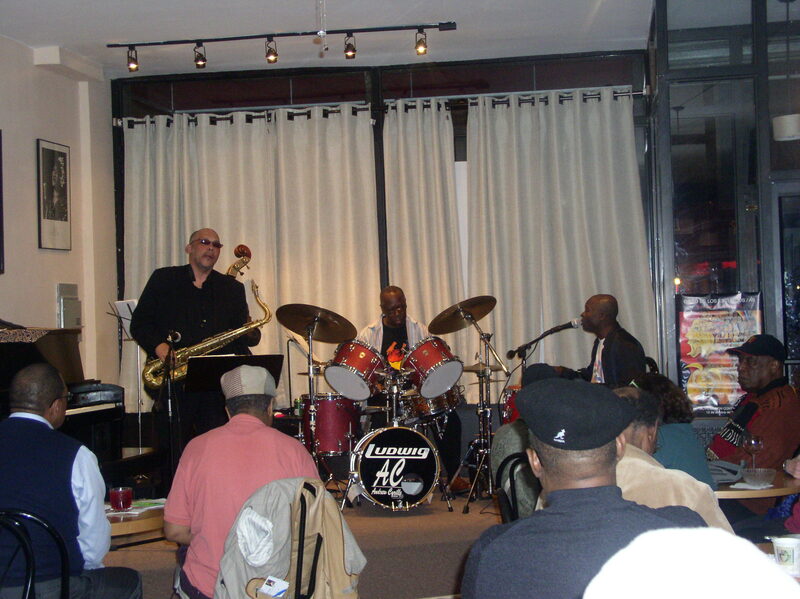 Last night, Saturday, April 3, 2010, the first night of the CBJC Jazz festival at Sistas’ Place we were privileged to hear Haitian Fascination, an incredible group led by drummer Andrew Cyrille. 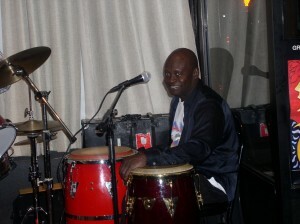 The first set opened with a haunting Haitian melody sung by Frisner Augustin who also plays the Haitian drums. The piece was accompanied by Andrew Cyrille on the multi-percussion drum set, Buyu Ambroise on tenor sax and Lisle Atkinson on bass. The intricacy of the interplay between Andrew and Frisner took us all to a place of African sensibility. A place preserved in the oral and musical traditions that were largely untouched by European or other influences for hundreds of years following the Haitian revolution of Toussaint L’Ouverture. There was considerable excitement generated in the room by the masterful percussion exchanges between Andrew Cyrille and Frisner Augustin, who is also an amazing vocalist. The music that followed was fitting for a set of musicians who have collaborated in various settings for twenty years or more. Lisle Atkinson leads the Neo Bass Ensemble while Buyu Ambroise has released several CD’s of his own music. The exception as far as longevity was Andrew’s relationship with Frisner, a founder of La Troupe Makandal, whom Andrew reconnected with following a collaboration with one of his New School students, Sarah Dupuy. Although all the musicians are leaders in their own right, Andrew generously led the group like a collective with each member contributing compositions. Andrew’s connections to Haiti and the community of Bed-Stuy are both very strong. He grew up around the corner from Sistas’ Place and mentioned in his introduction that his father and mother came to the US from Haiti in 1919 and 1926, respectively. Of the recent tragedy, he acknowledged the passing of two of his cousins and his need to communicate on a spiritual level about Haiti through his musical work. The music did seem to invoke the spirit of vodoun. Sistas’ Place has been working with and for Haiti prior to the earthquake. Madafi Pierre spoke during intermission about the Pan African response to the Haitian situation. She laid out some very important history which included the fact that the USA would have been a very different country without the Louisiana Purchase of 1804 which was directly connected to the successful revolt of the Haitian People in the same year. The Louisiana Purchase doubled the size of the United States as a result of that acquisition. After laying out the history and speaking eloquently about the current response on the part of the December 12th Movement, which includes the donation and delivery of 5,000 gallons of water, Madafi sung with Frisner Augustin and guest Neil Clarke accompanying. Her voice had a resonance and authority that invoked Africa and Haiti and when Frisner began to sing along, their combined voices were really something special to behold. Buyu Ambroise’s piece which means Conflict began the second set. 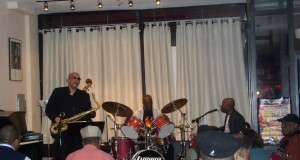 Andrew Cyrille and Frisner Augustin began playing over an ostinato bass line laid down by Lisle Atkinson. Frisner brought his vocal into the mix. The playing of Andrew and Frisner together reached a new level of rhythmic interaction. Buyu played the tenor with passion as Frisner complimented the solo with vocal insertions. The interaction between Andrew and Frisner at the end of the composition takes one right to Africa. There can be no doubt after listening to Andrew Cyrille and Frisner Augustin, that it is Africa and the drums that’s the source of Jazz: A Music of the Spirit. The second piece of the set began as a trio number with Buyu, Lisle and Andrew playing a song that had a folk ring to it. It was beautiful melody that was well appreciated by the sizable audience. Andrew’s mallet work was really marvelous, setting up a rich and forceful melodic layer. His playing was like thunder and it hit the mark every time. The melody that Buyu played was named Conviction and puts one in mind of John Coltrane. The next composition began with Frisner singing and playing in his inimitable African-Haitian style. The exchange between Andrew and Frisner once again took one to another plane. Lisle Atkinson had a song that he did in duet with Andrew that demonstrated the mastery of both those musician on their instruments. Neil Clarke, a master percussionist in his own right, was heard to say in response to this duet that these cats were playing so much music they were raising the bar and making it harder for everyone which is exactly what Jazz: A Music of the Spirit is supposed to be about. Ahmed Abdullah also shares a rich history with Andrew Cyrille with their membership of The Group, almost 25 years ago. Abdullah will take the lead for the festival on Saturday, April 10th, 2010.